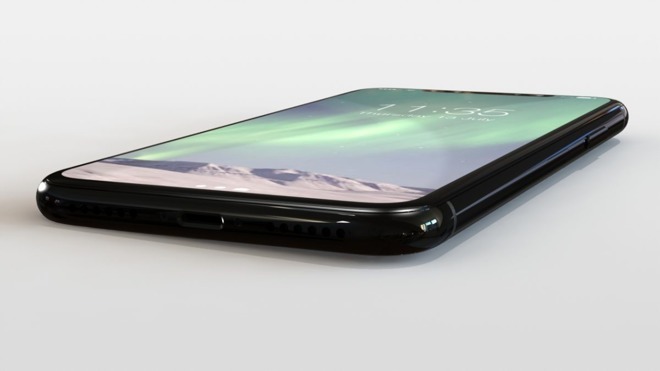 A week after a case manufacturer "confirmed" the iPhone 8 design, the same company has altered its rendering of the device slightly to conform to new ideas about the "notch" at the top of the screen for sensors, but still including a larger power/lock button and no rear Touch ID. Published on Sunday by Forbes, the new design from case manufacturer Nodus was published only five days after the last "confirmed" design from the company. The notch at the top of the screen with penetrations for sensors still exists, with the screen space adjacent to the notch filled with battery data and connectivity information. Also added are larger bezels, with what is described as a 4mm bezel to minimize accidental touches on the screen. While previously noted in April, the design published by Forbes again brings attention to a larger side power/lock button than is installed on the iPhone 7 Plus. 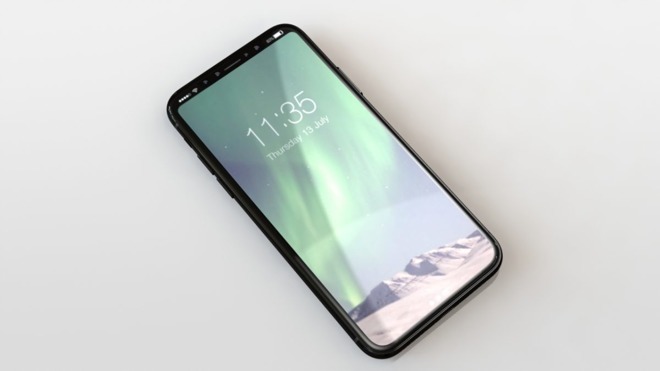 Some speculation started after the first reveal in April that some form of Touch ID may be embedded there —but there is no way to tell from the latest render. Also discussed in the report is the L-shaped battery, previously reported in March. Tuesday's report claimed that there is a "more protruding camera" in the "iPhone 8" than the iPhone 7, but that did not appear to actually be the case, based on the render provided at the time. Sunday's renders don't address the situation directly, but do show a device slightly tilted on a plane, possibly because of the camera protrusion. Nodus is apparently so certain of the design that it is basing its retail case offerings off of the data, and is now "fine tuning" its case designs off of what it has. It is still not clear if Nodus has its own source, or is piggybacking off of other rumors and leaks from the supply chain —such as the information provided in the report about the L-shaped battery. Apple does not generally provide new iPhone dimensions more than a week or two before launch to vendors, if before reveal at all. 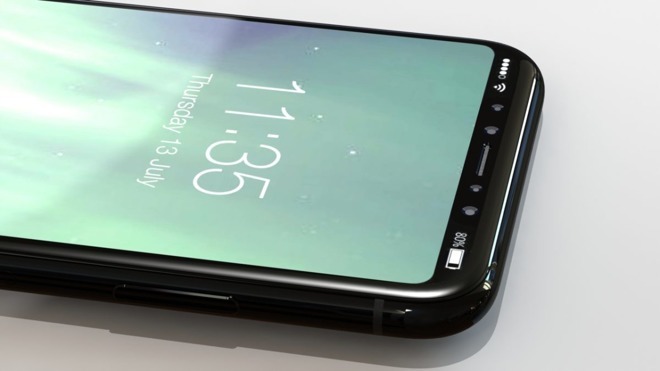 Regardless of design, the "iPhone 8" is rumored to be the first Apple phone with an OLED panel with 5.1 inches of usable space, and a bottom strip of virtual buttons. 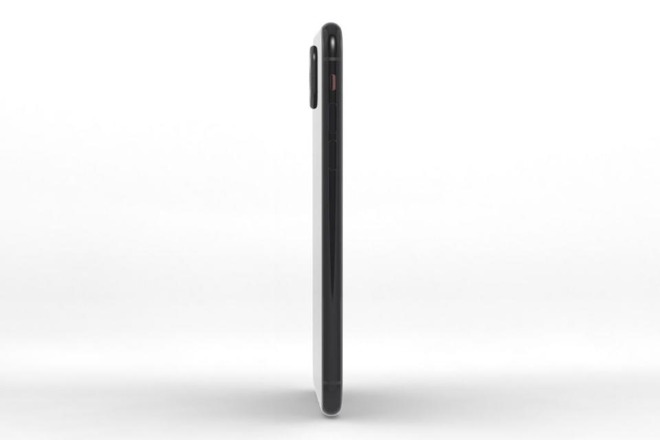 Also rumored to be included is a new 3D facial scanner possibly supplanting the Touch ID user identification system.